December isn’t the coldest month of the year, but it’s the darkest, with days getting progressively shorter most of the month. 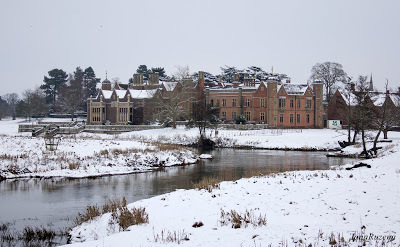 Earlier this week I visited Charlecote Park, the stately home near Stratford-upon-Avon, and couldn’t help thinking how much the lack of light must have affected people before electricity. Even with its huge windows, the great hall of the house was dark and gloomy. or often be letted and freat bellie full. It is now December, and he that walks the streets shall find dirt on his shoes, except he go all in boots: Now doth the lawyer made an end of his harvest, and the client of his purse: New Capons and Hens, beside beef and Mutton, must all die for the great feast…Now plums and spice, Sugar and Honey, square it among pies and broth,…Now are the tailors and Tire makers full of work against the Holidays, and Music must be in turn, or else, never: the youth must dance and sing and the aged sit by the fire…the Tapster, if he take not heed, will lie drunk in the cellar: the prices of meat will rise apace and the apparel of the proud will make the tailor rich…: and if the cook do not lack with, he will sweetly lick his fingers…To conclude, I hold it the costly Purveyor of Excess, and after breeder of necessity, the practice of Folly, and the Purgatory of Reason. Henry Peacham, too, in his book of Emblems, described how December should be represented in a picture: “December must be expressed with a horrid and fearful aspect… instead of a garland upon his hand, three or four night caps with a Turkish turban over them. His nose red, his mouth and beard clogged with icicles”. 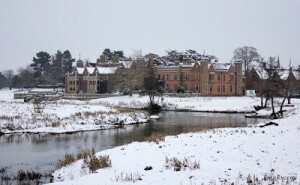 Back to Charlecote, I was there on what would otherwise have been a depressing December day for one of their new sessions about the house’s Library, one of the most important cared for by the National Trust. * Apparently one of the most common questions asked of guides at Charlecote is “Did the family actually read the books in the Library?” The number of handwritten annotations they contain show that they did. And the tomb of Sir Thomas Lucy (1585-1640) in the church at Charlecote, depicts him in front of shelves full of precious books. At these sessions it’s possible to hear about some of the many treasures held at the house, and to step into the beautiful library where conservators are undertaking the painstaking work of conserving books. 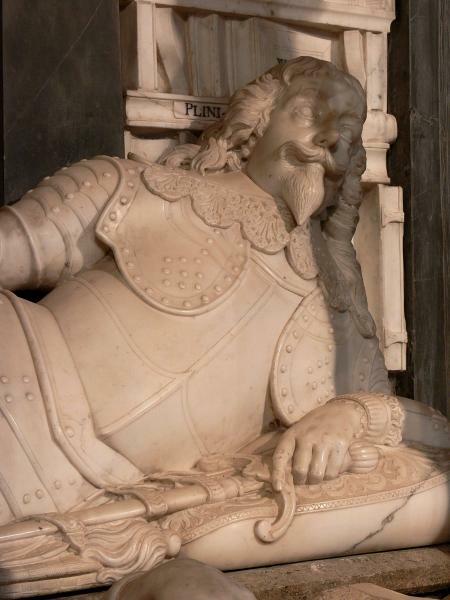 It’s fascinating to hear about the National Trust’s aim of protecting volumes from damage while also leaving them on display where they have been kept for centuries. This post explains more about this work. While many of the books from Shakespeare’s period were religious texts, some were more entertaining. 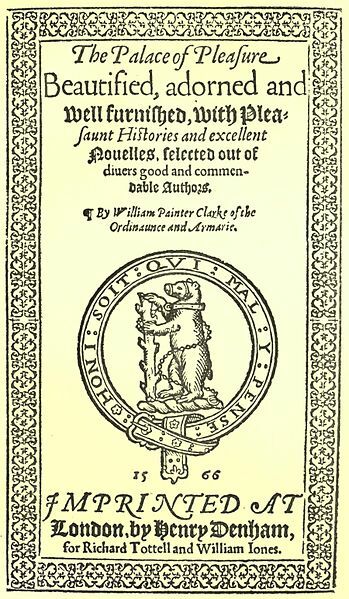 Charlecote contains a copy of the 1632 Second Folio of Shakespeare’s works, not suitable for display, but several books relevant to Shakespeare were shown off: a copy of the 1577 edition of Holinshed’s Chronicles, the source of many of the history plays, and a copy of Froissart’s Chronicles. This contains accounts of the reign of Richard II, and was in turn quoted by Holinshed. Another important source book is William Painter’s The Palace of Pleasure, a collection of popular stories. 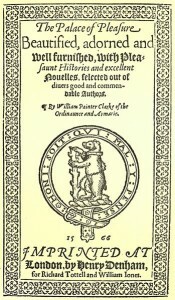 The second volume, first published in 1567 and reprinted in 1580, contains the story of Romeo and Juliet, though by the time Shakespeare wrote his play the story was already well-known. The library contains other collections based on classical and medieval stories, including those by Giovanni Boccaccio (1313-1375) and Cinthio Giraldi (1504-73). More of these sessions are planned. See here for more information. Shakespeare himself must have been lucky to have had many stories told him during the bleak days of “old December’s bareness”. *With special thanks to Jo Wilding and members of the Shipston-on-Stour U3A who allowed me to tag along. This entry was posted in Legacy, Shakespeare's World, Sources and tagged books, Charlecote Park, conservation, Cymbeline, December, Froissart, Henry Peacham, Holinshed, Nicholas Breton, Sir Thomas Lucy, Thomas Tusser, winter. Bookmark the permalink. Getting us in the X’mas mood.